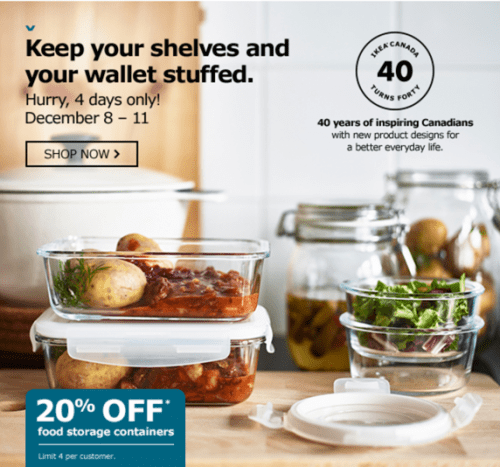 Don’t lose the flavour of the food and keep your meals and leftovers fresh and tasty with this sweet food storage sale at IKEA Canada! This weekend IKEA is offering 20% off on food storage containers and organizing. While supplies last. No rain checks. Limit 4 per customer . This IKEA offer is valid from today, December 8 until Sunday, December 11, 2016 only, in-store, online, pick-up and order points and collection points. Selection may vary by store. IKEA Canada bases their shipping rates on the size, weight and retail value of your order, so it will be different for each order. Click here to get this deal online at IKEA Canada.